There are a few cycle routes and walking trails, which are circular and marked with one of the colours: yellow, red, green, blue. The routes go through the valley, but also over some lower mountains (e.g. Weska, Furmaniec) and hills. All of them are partly led along some streets in Korbielów (ul. Beskidzka, Krzesakowa, Widokowa, Graniczna, Pod Weską), so you can start from almost any place you are accommodated in or from the public car parks (in the vicinity of the Smrek inn or by the Pilsko ski resort). Mostly they run across meadows, forests or fields. 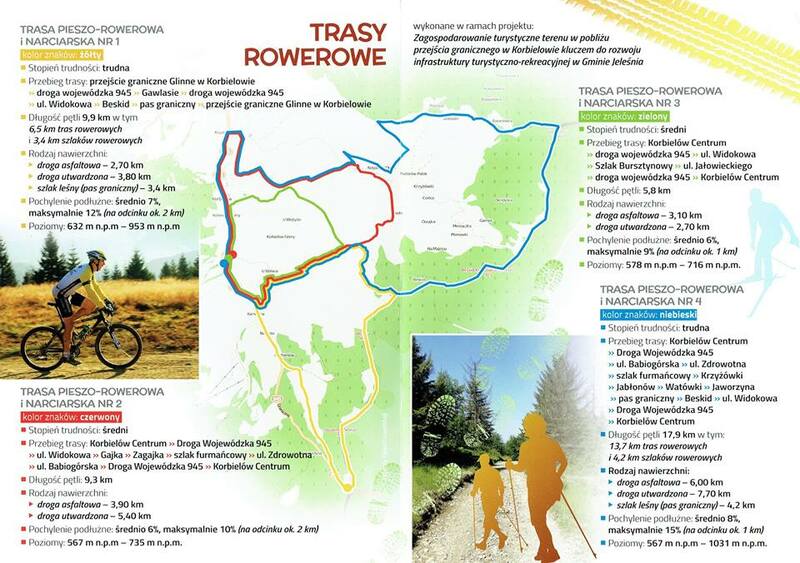 Since the routes have good surface, you can easily walk long distances, admiring surrounding landscapes with Pilsko and Babia Góra in the background or observing nature. The trails are well-marked with plates, if we start our trip at one of the plates (e.g. from the car park near the Smrek inn), you will certainly be able to walk the full circle.